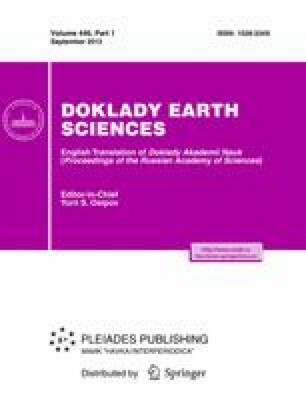 The material and isotope-geochemical peculiarities of zircons from dunites of the Kondyor massif (Aldan Province, Southeast Siberian Craton) have been described for the first time. This massif is associated with an economic platinum placer deposit. On the basis of detailed study of the morphology, internal structure, and geochemical characteristics, zircons have been subdivided into two types. The first type is represented by crystals of oval and rounded shapes, characterized by a bimodal distribution of “ancient” (2477 ± 18 and 1885 ± 52 Ma) U-Pb (SHRIMP-II) ages. The second type of zircons forms idiomorphic crystals and aggregates of prismatic habitus, forming two “young” age clusters (176 ± 1.2 and 143 ± 2.0 Ma). The obtained results allow us to make a conclusion about the long evolution of platinum-bearing dunites. The first type of zircons formed by metamictic cores and homogeneous peripheral rims indicates the time of metamorphism at the Archean-Proterozoic boundary (∼2.5 Ga), implying an older age of porous zircon cores. Such zircons characterize the minimal age of the initial mantle substance or a close time when the platinum-bearing dunite was generated. Based on their formation time, the second type of zircons can be referred to the epoch of tectonic-magmatic activation of the Aldan Shield. The new geochronological data, along with the material identity of dunites from the Urals and the Aldan Province, argue for a common genetic origin of platinum-bearing dunites of the fold belts and ancient cratons. Original Russian Text © K.N. Malitch, A.A. Efimov, I.Yu. Badanina, 2012, published in Doklady Akademii Nauk, 2012, Vol. 446, No. 3, pp. 308–312.